After putting on the deep race wheels on my road bike, it is suffice to say I was disappointed to hear SKCC crit had been cancelled. Thankfully the Stay True/Nacional boys were keen to ride, so a plan was hatched to whip out a lap of the TdB loop. A lot like yesterday the hills weren't my friends, this time it was (Nick) Bensley, (Mark) Guirguis and an assortment of others who were doing the damage. I managed to strike a blow on Williamsons road, coming off a few wheels with some speed then punching it hard to go clear of everyone else. When I chased down Mark up Foote st, I almost thought that it might not all be lost for me and hills, but I knew that Burgundy and the cutting were still to come. 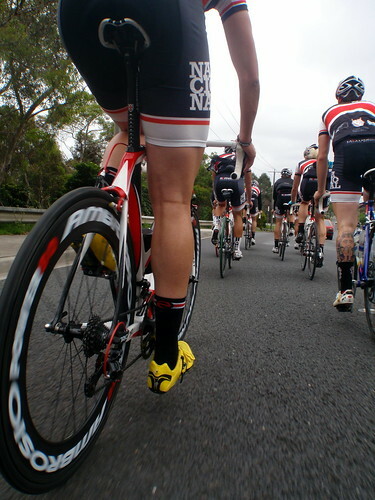 Thankfully these were both effectively neutralised when the group was split into two "teams" so we could race from Ivanhoe East through to Red Rooster. The opposing team shut down our early solo move of Bensley and with no one else from my team near, it looked like my job of delivering Jarrod to the line was becoming a bigger and bigger task. Mark and Carson were clear over the Ivanhoe/Ivanhoe climb and at the top when I turned to check on Jarrad, he wasn't on my wheel. The resulting wait meant there was a mountain of work to do, so I just put my head down and hammered out an ITT effort into the base of the Red Rooster kick, but it was obvious we'd been bested. Thankfully the group decided to do some hill sprints on the lower part of Yarra St, which gave me a chance to take some (read: all of the) wins and thus restore some pride.